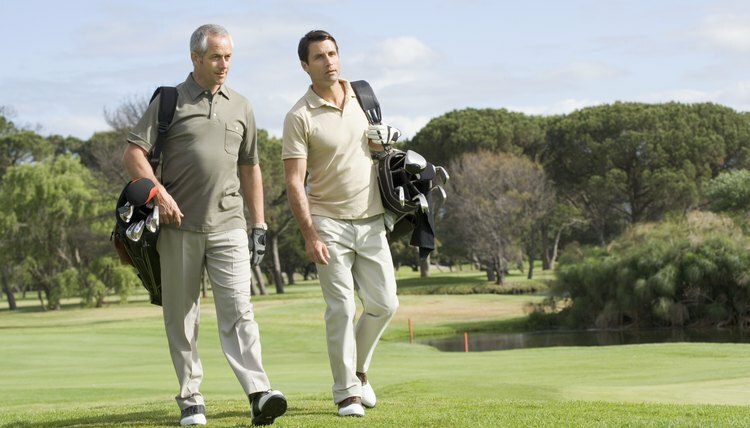 You won't know if your team won its zig-zag golf event until after you've finished play. The zig-zag method is an unusual golf handicapping style that’s much more random than the traditional USGA handicapping system. The standard golf handicap system levels the playing field, based on each golfer’s peak ability. If you play your best, you have a fair chance to beat any other golfer in a standard handicapped match or tournament. Handicapping isn't so simple in a scramble format, so the zig-zag system offer a fun change of pace in that format or for other team events. Select three holes at random as the handicap holes, but do not inform the players which three holes you’ve chosen. Collect the teams' gross scores after the tournament, noting the actual number of strokes each team took. Take 30 percent of the combined score on the three handicap holes for each team that shot 59 or below. This will be the team's handicap allowance. Take 70 percent of the combined score on the three handicap holes for each team that shot from 60 to 64; take 90 percent for teams that scored from 65 to 69; and take 120 percent for any team scoring 70 or higher. Subtract the handicap allowance from the gross score to get the net score. The winning team is the one with the lowest net score. For example, a team with a gross score of 58 that takes a total of 15 strokes on the three handicap holes would receive a handicap allowance of 4.5 strokes (15 x .3), leaving the team with a net score of 53.5. A team that shoots a gross 72 and takes 18 strokes on the handicap holes would receive an allowance of 21.6 strokes (18 x 1.2). The second team’s net score would be 50.4.